The gist: Could a lack of sleep help explain why some people get much sicker than others? This week we’re bringing you an episode from our archives. It’s called, “The Economics of Sleep, Part 1.” And yes, that means that there’s a Part 2, which you’ll hear next week. We thought it was time to replay these episodes because they are two of our most popular episodes ever. Now, why is that? I think it may be because as much as people tend to focus on nutrition and exercise as the vital inputs in maintaining the human machine, sleep often gets overlooked. So, let’s stop overlooking it, yeah? Hope you enjoy, and I hope you learn as much about sleep as we did in making this episode. Graciela Phlatts (she goes by Grace) is a nurse and the clinic’s director of nursing. She was born in Panama, moved to New York about 20 years ago. PHLATTS: Something that I always say to everybody: I was born to be a nurse. I love nursing and I love my patients. PHLATTS: You will be surprised to see the income that some people make here. Approximately between 60 to 65 percent of our patients, they are under the poverty level. Hypertension, diabetes and obesity. Heart disease, too. On the face of it, there’s nothing noteworthy about this predominance of chronic diseases. According to the Centers for Disease Control and Prevention (CDC), 86 percent of U.S. health care spending goes to treat chronic diseases. But what is noteworthy is that these conditions are much more concentrated among certain groups of people. SHERMAN JAMES: We’re talking about a twofold gap — at least a twofold gap — for the major killers, which would of course include heart disease and diabetes. That’s Sherman James. He is a professor of epidemiology at Emory University. For decades, James has been studying the black-white gap in health. African-Americans, he says, have a substantially higher risk of death from heart disease and stroke. Blacks are as much as three times more likely than whites to have high blood pressure. This racial health disparity has been known to researchers for decades. What isn’t known is: why? There are all sorts of hypotheses. One that Sherman James has put forward is called “John Henryism.” That’s from the folk legend about John Henry, the “steel-driving man,” the old-school strongman who got into a race with a newfangled steam hammer. John Henry won, but then he collapsed, and died. The idea behind John Henryism is that blacks, because of discrimination and lack of opportunities, have had to work so much harder than whites, even in the same kind of jobs. And all that hard work, Sherman James says, puts more stress on the body. But even James — who has run study after study and is an expert on African-American health — admits that none of this is conclusive. Well, there is another theory — the one we’ll be talking about today — that says the black-white health gap might be related to something that all of us do every day, something that our body forces us to do every day or, more typically, every night. HALE: And I study sleep patterns. I call it the social patterning of sleep. HALE: Is it true that either racial minorities, low-educated, low job-security individuals, people who live in high-risk neighborhoods, who experience fear at night — are these people who clearly have some sort of social disadvantage, are they also not sleeping as well? And is this impaired sleep affecting not only their ability to function the next day but their longer-term health outcomes? That is just one of the questions about sleep we will try to answer today. But because sleep is such a big and interesting topic — and, let’s face it, it’s also kind of weird, the fact that our bodies shut down entirely for roughly a third of our lives — because of all that, we are actually making two episodes about sleep. You’ll hear the second one next week. And, this being Freakonomics, we ask what the data have to say about sleep. As you will hear, even that is not always easy to figure out. LAUDERDALE: We found that people with more education got more sleep and people with higher incomes got more sleep. DUBNER: You’re talking to someone who does sleep with an eye mask and earplugs, just so you know. DUBNER: And that’s because of my schedule. For a bunch of years when I was traveling a lot and different time zones and whatever, I needed to sleep sometimes on planes or trains or whatever, in a hotel room when I’d get somewhere and it would be daytime. And so I started using those sleep aids and then I just got used to them and then they became Pavlovian for me. So now, the minute I put in the plugs and the face mask, wherever I am, I just go to sleep. So I do it even at home. It’s just like a habit. Which is kind of weird and annoying sometimes to my wife. Hale likes the bedroom dark and cool (as do I, by the way). She likes a nice flat pillow, not too fluffy. (I go for medium-fluffy.) And Hale, like me, is married, with two kids. But my kids are 14 and 13. Hers are much younger; the second one was born just a few months ago. Which means that Mom is not sleeping as much as she’d like. HALE: I wake up two-three times a night. My youngest one is not yet sleep-trained. And it’s very difficult to sleep well when you know you have to feed a child. HALE: I know that my period of disrupted sleep, chronic disrupted sleep, is time-delimited, where I understand from my research on low-income, high financial-insecurity individuals that not everybody has that luxury of knowing when they will resume a full night’s sleep on a regular basis. DAVID DINGES: Well, 20 years ago, we didn’t know much about that. Because sleep is so central to health, Lauren Hale really wanted to find some data that showed how much, and how well, people sleep. And she did. The CDC regularly conducts the National Health Interview Survey. One year, the survey happened to ask people about sleep. HALE: I was interested in the sleep disparities present among adults. And we found these stark differences. The National Institutes of Health recommends that people get between seven and eight hours of sleep a night. In the CDC survey, nearly 31 percent of black respondents said they slept less than six hours a day, compared to just 23.5 percent of white respondents. The black respondents were also – perhaps, not coincidentally – more likely to be very poor. This led Lauren Hale to consider the possibility that blacks and other minorities are more likely to suffer higher mortality in part because of the short sleep durations. DIANE LAUDERDALE: It’s quite difficult to get accurate information about people’s routine sleep behavior. LAUDERDALE: The obvious one is to ask people, “How much sleep do you usually get at night?” And that seems like it should be a great way to find out about sleep, just like if you ask people, “How tall are you?” or “How much do you weigh?” you get a pretty good answer. It turns out, though, that sleep is hard. People don’t actually know the answer to that question. We don’t come with an internal clock, and so, when people are sleeping, when they wake up, they have no idea usually how much they’ve slept. DUBNER: Well, plus, I guess you also don’t really know when you fell asleep. I may have gotten in bed at 11:00, but I might not get to sleep until 11:25 or something and I might not be aware of that, right? LAUDERDALE: Right. Well, you’ll know that it took you awhile to go to sleep, but you might not be at all good at estimating how long it was, whether it was five minutes or 40 minutes. In addition, for many people, routines vary day-to-day. And so there’s not only the problem of not knowing on any one particular night how much sleep you got, but in answering a question about routine sleep behavior, not really having a good sense of how to average behaviors over days when in fact you don’t know how much you actually slept on any of them. LAUDERDALE: One approach people in surveys, unfortunately, often resort to is just giving an answer which they think will be a well-accepted answer to the person interviewing them. On the other hand, some people may have reason to underreport their sleep. Maybe you’re generally unhappy or unwell and you figure that it’s because you’re not sleeping enough. Or maybe you’re the kind of person who thinks that sleep is for suckers. LAUDERDALE: There was a period, in the ’80s, ’90s when, you know, Margaret Thatcher, Bill Clinton really bragged about only needing four hours or five hours of sleep. And there was this period when being short sleepers was really held up as evidence that you were leading an important life. LAUDERDALE: I think far fewer people brag about how little they’re sleeping. They’re more likely to be complaining about how little they’re sleeping and valuing sleep. This survey concluded that Americans typically slept eight to nine hours a night, with just two percent of respondents sleeping six or fewer hours night. Fast-forward now 35 years, to 1995, when the National Sleep Foundation did another sleep survey. The NSF happens to take money from pharmaceutical and mattress companies, but they claim independence and academic rigor. Lauren Hale, for instance, the sleep researcher at Stony Brook, is on the NSF board. Anyway, this survey found that nightly sleep had dropped to seven hours. And then in 2007, the CDC survey reported that 30 percent of American adults were sleeping six or fewer hours, and these findings were often getting compared with the 1960 data. But there’s at least one big problem with the American Cancer Society survey: volunteers recruited friends and family to participate, so the sample set wasn’t even trying to represent the population as a whole. So Lauderdale is not buying the argument that we’re all sleeping less. In fact, she says she’s found some evidence to suggest that teenagers, at least, spend more time in bed than they used to. LAUDERDALE: So that strongly suggests that there’s not a big trend towards less sleep. LAUDERDALE: The evidence that sleep matters for health — while growing and to some extent pretty compelling — is not as strong as the evidence that physical activity and diet matter for health. I think we really need to know better how sleep is related to health. It’s absolutely clear that sleep is related in some ways. We just don’t have a lot of clarity about which those are and exactly how it matters. So what do you if you do want some clarity about sleep, and you don’t want to just rely on self-reported data? In recent years, researchers have turned to something called actigraphy. That means you attach a small accelerometer to someone’s wrist — think of a Fitbit — and it tracks their arm movements. LAUDERDALE: So some of the difference we found had to do with economic and education factors, but not all of it. So with this actigraphy estimate — and I’m intentionally highlighting that — we found that people with more education got more sleep and people with higher incomes got more sleep. OK, so based on relatively objective data, it does seem that people with more education and higher incomes get more sleep, and that whites get more sleep than African-Americans. That’s a nice, clean, bold conclusion, isn’t it? C’mon people, this is Freakonomics Radio. We’re not just going to leave it there, are we? No, we are not. Dan Hamermesh started studying sleep in the late 1980s in part because he wasn’t getting enough. Some nights he’ll sleep for eight hours but then only six the next. His wife worries about him, and she won’t let him work past 9 p.m. So he tends to get into bed pretty early. HAMERMESH: I’ve been married for 48 ½ years. I like to sleep on my left side. I insist on being on the right side of the bed. I sleep on my left side, and cuddle up to my wife who’s sleeping on her left side. If I’m by myself in a hotel, as I am occasionally, I sleep on my left side. And I hug a pillow in place of my wife. When he’s not hugging his pillow — or his wife — Hamermesh likes to crunch data. He’s a big fan of the American Time Use Survey, which is produced by the Bureau of Labor Statistics. It covers roughly 150,000 people. But, unlike the typical survey, which just asks people to say how much time they spend doing a particular activity — sleeping or doing housework or whatever — the American Time Use Survey asks them to account for every minute out of all 24 hours. This is meant to lessen the bias against particular activities. HAMERMESH: I think it’s a wonderful thing. They started this in 2003. It is by now the world’s largest ongoing — the only ongoing — continuing study of how people spend their time. A tremendous revolution in data for people like myself. When we asked him, Hamermesh was good enough to look into the sleep numbers from the A.T.U. — is it A.T.U.S., or A-TUS? OK, so what do the ATUS data tell us about sleep? All right. Any variance by gender? HAMERMESH: Well, we know that women on average sleep about eight minutes more per night, than do men, which is not a heck of a lot, but it adds to an hour a week. That’s the first thing. HAMERMESH: Among people who have little kids, ages zero through two, for men that results in about eight minutes per night of reduced sleep compared to other men who have no kids. Whereas among women, it results in 16 minutes per night — almost close to two hours per week — of reduced sleep. So despite the alleged great efforts that men are making these days to increase equalization of behavior in the household in fact, sleep reductions are much bigger among women than among men who have little kids. HAMERMESH: Immigrants sleep more given their education, their age, their gender, number of kids, marital status. And that’s especially true for male immigrants. For men, it’s 20 to 25 more per night, which is a huge amount. That’s 20 to 25 minutes per night, which does suggest that America tends to be a bit more sleepless than the rest of the world. But let’s get back to what we’re here for: to look at differences between high and low-income sleepers, and how those differences might influence something as important as life-threatening disease. Remember, the other data we’ve been discussing has all suggested that higher-income, higher-education people sleep more than low-income, low-education people. What does this ATUS data have to say? HAMERMESH: The answer is very, very clear. Those who earn more money per hour, who have better — what we call in economics, opportunity cost of working — they sleep less. Those who have more education, because education increases your opportunities in the labor market, one should expect, and one observes that the more educated you are, the less you sleep given your demographics of age, ethnicity, marital status and presence of kids. It doesn’t differ much between college dropouts and people with Ph.Ds. The big difference is between those who have some college or more compared to high school grads or high school dropouts. And we’re talking 15, 20 minutes for men per night. Which is a lot. I mean that’s a couple of hours out of your 168 per week. That’s a substantial amount. It would seem that, on average, that is true. The ATUS data show that black men, for instance, sleep eight or nine minutes more per night than white men. For women, the gap is even wider: black women sleep roughly twenty minutes more than white women. But Lauren Hale, the sleep researcher, says that average sleep duration is not the key metric. What you want to do, she says, is break down the ATUS data further. You want to look at people who sleep fewer than six hours a night — “short sleepers,” as researchers call them — and, also, the very long sleepers. Dan Hamermesh was focusing on the averages. HALE: I think he’s wrong because I’ve looked at the data, and I think you have to separate out who are the short sleepers and who are the long sleepers. HAMERMESH: Let me just look at this for a second if I could. OK.
HAMERMESH: The average black, be it male or female, is more likely to sleep very short hours, less than six hours per night, also much more likely to sleep very long hours, more than 11 hours a night. In other words, there’s more extreme sleep by blacks than by whites, both very short sleep and especially very long sleep. And that’s a new finding. I’ve not seen that before. The fact seems incontrovertible and really neat. DUBNER: So they’re more efficient in bed? Lauren Hale, from Stony Brook, believes the racial sleep gap may be driven in part by environmental factors. African-Americans are more likely to be poor and live in a neighborhood that is not optimized for sleeping. HALE: The high-risk neighborhood is noisier. The apartments are crowded. Apartments aren’t as well air conditioned or heated because it’s a low-income household. There is more light outside on the street. There’s an airplane flying overhead. There’s a street brawl going on outside. Maybe it’s something about being in that neighborhood. So what if you take that person out of the neighborhood and see how they sleep in the country or in the suburbs? Would their sleep improve? We haven’t done that experiment. But the question is, well, is it really living in a high-risk neighborhood that’s the problem? Or is it more of a compositional problem of who lives in a high-risk neighborhood? And who lives in a high-risk neighborhood are the same type of people that we’ve already reported are at higher risk of poor sleep. Hale is currently doing research with a project called the Fragile Families and Child Wellbeing Study. It’s following nearly 5,000 kids born in the U.S. between 1998 and 2000, most of them to unwed parents. Now the kids are teenagers, and Hale’s team is using wrist actigraphy to track their sleep. HALE: It is on the brink of becoming even more persuasive but in December, Anne-Marie Chang and Chuck Czeisler at Harvard published an experimental study where they kept people in a laboratory at night. Some people were reading the same content on a book and some people were reading it on an iPad. And those people who read it on an iPad had exposure to the light and had trouble to falling asleep and lower quality sleep. So it’s persuasive. DUBNER: So you say you do use some screens. Do you use screens for reading? For watching TV? What do you do? DUBNER: And what are you looking for? When you say, “I look at.” What are you looking for? DUBNER: You read like books? Or you read e-mails and Instagram and Facebook? DUBNER: It’s funny because when you say, “nothing heavy,” because I hear people say that all the time. Like, “I just look at that kind of stuff,” and I would argue personally, for me at least, and this is just an n of one, that that would be way more disruptive or distracting to sleep than reading an actual book. Because when I read a book, I’m reading it kind of for pleasure and also to learn, and I’m focused. And it doesn’t distract me in a way that seeing like, “Oh that’s what that person is up to and I wonder what that means for me and my family and my life. And oh my goodness, so and so went to Antarctica, I wonder if they’re going to bring me back some frozen penguin poo as a gift? Wouldn’t that be great.” You know? And so, when you say that it’s just light stuff, to my untrained brain, I would think that’s the worst thing you could possibly do. HALE: You’re completely winning in this argument. I should not be reading my iPhone before bed. You’re inspiring me to take my own advice and try it for a week. Put the screens down. I did a screen-free week last year, actually, with my kids. With, at that point, one kid. It wasn’t that hard. But I think the real challenge is try it for a week and see if you feel better, if you’re sleeping more, if you’re going to bed earlier, and see how you feel. DUBNER: OK, so I want to make this concrete. So are you saying right here and right now that you vow from today going forward, for one week, that you’re going to do what? That you’re going to put all your screens outside of the bedroom at a certain time, let’s say? Is that what you’re offering? HALE: From nine o’clock onwards. Of course, I have a little baby who falls asleep at seven, so I try to fall asleep even sooner. But yes, from nine o’clock onwards, including when I’m up in the middle of the night nursing, I vow not to look at my iPhone, my smartphone, or my television until seven in the morning. DUBNER: Awesome. OK, so here’s what’s going to happen. We’re going to get you back on the line in a week and we want to know what happened, and we want to then know, obviously, if what you learn about yourself might inform somehow where you want to go down the road for future sleep research. Does that sound OK? HALE: OK. That sounds fantastic. OK.
HALE: Talk to you then. OK, bye bye. SPENCER ROTHFUSS: My name is Spencer Rothfuss. I’m 16 years old and live in Omaha, Nebraska. I sleep fully dressed in the next day’s clothes so I’m ready to go in the morning. JENS BONKE: There was a significant differential in the sense that morning-type people earn four or five percent more than evening-type people. Freakonomics Radio is produced by WNYC Studios and Dubner Productions. This episode was produced by Christopher Werth, and it was mixed by Rick Kwan and Merritt Jacob. Our staff also includes Arwa Gunja, Jay Cowit, Greg Rosalsky, Kasia Mychajlowycz, Alison Hockenberry and Caroline English. 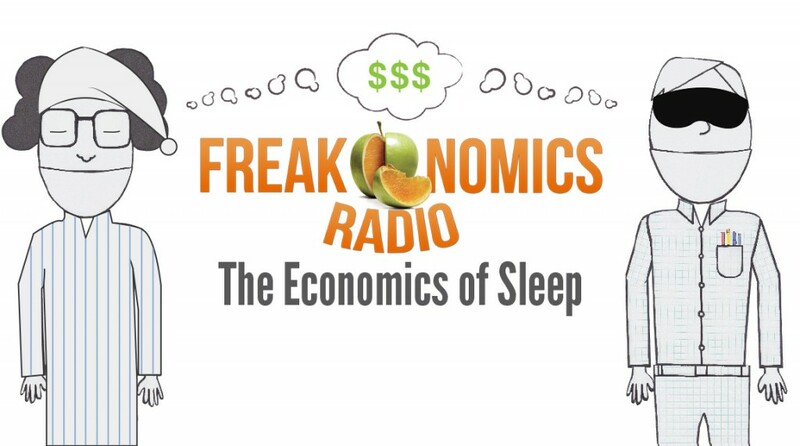 If you want more Freakonomics Radio, you can also find us on Twitter and Facebook and don’t forget to subscribe to this podcast on iTunes or wherever else you get your free, weekly podcasts. “Effects of Experimental Sleep Restriction on Weight Gain, Caloric Intake, and Meal Timing in Healthy Adults,” by Andrea M. Spaeth, David F. Dinges, Namni Goel (January 2013). “Inadequate Sleep Duration as a Public Health and Social Justice Problem: Can We Truly Trade Off Our Daily Activities for More Sleep?” by Lauren Hale (Sleep, October 2014). “Racial Differences in Self-Reports of Sleep Duration in a Population-Based Study” by Lauren Hale and D. Phuong Do (Sleep, September 2007).